Well, we did it! My Austrian husband Markus and I are now officially digital nomads. We’ve sold all of our belongings, but kept our jobs – and will be moving to different cities and places for a few months at a time. 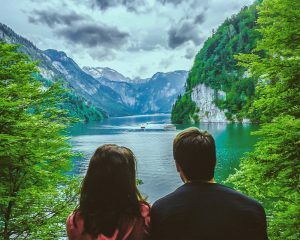 Our goal is to “live like locals”, work from anywhere and get a good feel for each new place – while laughing at (my) German and (his) English mistakes in our conversations and overcoming our (more than you would think) Austrian-American cultural clashes along the way. Our Austrian Wedding in Mondsee, Austria – Complete with Lederhosen and Dirndl! How can we do this? With my job as a German-English freelance translator, and Markus’ as a remote software consultant, we’re lucky in the fact that all we need for our jobs is internet and a computer – we’re not required to be at any certain office in any certain city. 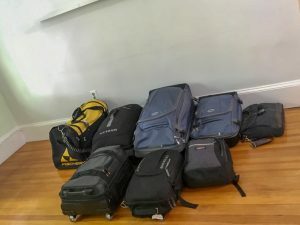 With that in mind, we decided over a dinner date in January to sell all our belongings this summer, donate most of our clothing, and live with 2 suitcases, plus our carry-ons, per person (can you guess which of us has more?). How did we do it? This past June, we began taking photos of all our furniture and posting these in Facebook Marketplace. Facebook Marketplace made it very easy to sell all of our things, especially in a city like Boston where there are many students and transient international residents looking to save a little money. The translator in me was thrilled to get to practice my (basically non-existent) Spanish for some of these negotiations, and we also got to meet some kind and interesting people as they came to pick up our furniture (that’s the great thing about Facebook Marketplace – they come to your apartment to pick everything up). But it wasn’t always smooth-sailing – over the course of three weeks, we had no less than 60 different people come to pick up various items – anything from night stands to lamps to our bed – and some people would just not show up after we’d arranged a specific time for us to meet them. This may not sound like a big deal, but when you have 60 different items you’re trying to sell on a Facebook platform, having to start all over in the furniture-posting process (we usually received about 10 messages per item, and had to write each person back to work out price and details) was a lot of work after you thought it had been sold and checked off the list! When we wrote to ask why they didn’t come, we heard all sorts of reasons: sudden broken foot, sudden car accident, sudden hospital visit due to stomach issues, emergency room visit for their dog, sudden flat tire, a friend happened to give them the very same item that morning, etc. While I’m sure some of these must have been true, it would have been a very bad week in Boston if they all were! But we tried to stay positive, laugh at the frustrations, and keep at it. In the end, we got rid of everything, and the people who did show up were all very nice. 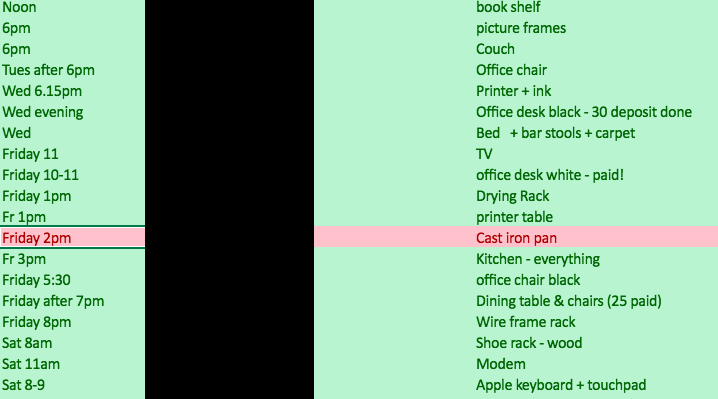 A Look at Part of Our Spreadsheet for Selling Our Furniture/Pick-Up Times – Very Busy! As for clothes, shoes and knick-knacks – those things we either donated or gave away. We had a going-away party the Saturday before we moved, and set up a “room of free stuff” for our friends to take home what they wanted. It can be hard to give away things you’ve become attached to (for me at least, the emotional one of our relationship!) and it made me feel better to know that my friends could get good use out of them. We donated the rest to Goodwill or the clothing bins at Whole Foods, which go to the Epilepsy Foundation. And some bags we ended up giving to our furniture-buyers from Haiti and the Philippines, who said they could use the clothes to send home to people in their respective countries. 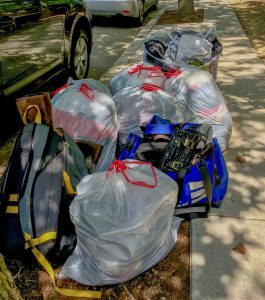 Our Final Trip to Goodwill – Lots of Bags of Clothes! On June 30, we officially became apartment-free nomads! We will be staying in AirBnBs in each place we go to, which will allow us to feel like we have a “home” for the 2-3 months we are there. 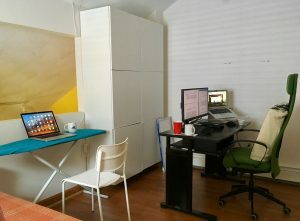 If the home has two desks, then we will both work there, and if not, we will check out the local coworking space in the area. For those of you who don’t know, a coworking space is a place where freelancers can go to to work – a shared workspace with other freelancers, an office away from home, a way to get out of the house and meet other people. 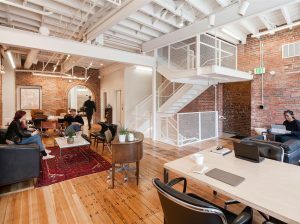 My previous coworking space in Boston, The Village Works, was my favorite one yet – I only hope our future coworking spaces can live up to its friendly atmosphere, healthy snacks, great sense of community and beautiful location. And now, on to the most important question … where are we off to first?! Well, it’s a bit complicated. We have a wedding in New York this weekend, so were able to stay with friends in Boston and work for a few days before we left for the wedding. After New York, we’re headed to the quaint seaside town of Rockport, Massachusetts. And then it’s officially off to Destination Number 1: Denver, Colorado! We will be there for a few months, and then? You’ll just have to wait and see! To stay updated on our travels, see some of our favorite travel pictures and to laugh at our intercultural struggles and language mistakes along the way, follow us on Instagram @acultureapiece and Twitter @acultureapiece. We’re excited to share our journey with you! This is so exciting!! I already look forward to your posts! Thanks Amanda! We just now are getting all our comments due to a set-up error – but everything should be good to go now. New post coming soon! Just WOW!!! You go, Katie & Markus! Wow! This is very exciting & I can’t wait to follow your adventures! Hope you will end up with some peak life experiences. Ummm….SO COOL!!! I’m very excited to follow you on this journey! Good for you guys! Thanks Laura! We just now are getting all the comments due to a WordPress set-up error, but are good to go now. Hope things are going well for you! Love you both! Safe travels! I am so thrilled about your adventure. Thanks for keeping us posted. I will be taking notes. Enjoy and best of luck. Thanks Daphne! Just now seeing this as we weren’t getting notified about approving comments. Hope things are good in Brookline!